The "Black Box" Cockpit-Voice-plus-Flight-Data-Recorder is the invention widely attributed to Dr David Warren (full name David Ronald de Mey Warren) of what was then known as the Aeronautical Research Laboratories (ARL) at Fishermans Bend, Melbourne, Australia. At the time of the invention, ARL was part of the Commonwealth of Australia's Department of Supply - ARL later became part of the Defence Science and Technology Organisation (DSTO), part of Australia's Department of Defence. Following the rapid development of jet fighters during the Second World War, the British began to develop the first jet-powered airliner, the famous Comet, which first flew in the 1950s. However in 1953 a number of the aircraft crashed inexplicably, putting doubt in the public's mind about the safety of jets. Aircraft engineers and scientists all round the world were also perplexed. The cause of the crashes had to be found or the Comet would be doomed to failure. Many professional committees discussed the possible causes at endless meetings. Dr Warren, who was a combustion/fuels specialist, was one of those involved with some of these meetings, his role being to consider whether a fuel fire/explosion could account for the crashes. It was at this time that he conceived the idea of some sort of recording of the flight crew's conversation, and of protecting the record so that it would survive the crash. Such recording would have a heavy bias in the field of electrical engineering. While Dr Warren had some competence in the electrical field, gathered mainly via self-interest in the field, he required electrical design assistance from specialists in that area. Magnetic wire recorder of small time-span with continuous over-write capability ensuring that the recording medium did not require regular replacement. Dr Warren referred to his invention as the "ARL Flight Memory system". The term "black box" was believed to have been attributed to a journalist. In the early days black box was in common usage for such things as a mystery box of electronics for which the main interest was in what goes in and what comes out rather than what is inside the box and how it works. Black Box has now become the accepted term recognized by the general public for accident recorders even though, for aircraft, a readily distinguishable orange colour is standard. In 1958 Dr Warren reported (Ref. 2) on extensive cockpit microphone tests he had undertaken (probably in 1957) on Vickers Viscount and Douglas DC-6B planes under arrangements provided by the Department of Civil Aviation. He concluded that good intelligibility could be achieved with optimum microphone choice and placement, and using noise cancelling arrangements. With the Mk 1 recorder on hand in 1958 the lack-of-interest stalemate was finally broken in that year when the Secretary of the UK Air Registration Board, Sir Robert Hardingham, happened to see the recorder while on an informal visit to ARL. His enthusiasm was instantaneous. He arranged for Dr Warren to take the recorder to England to demonstrate it. The response to the demonstration in the UK was most encouraging. The BBC featured the recorder on evening television and Radio Newsreel. Many UK manufacturers and operators offered their support, and the British authorities began a move to make recorders mandatory in British civil aircraft. Progress in Australia had to wait until the unexplained crash of a Fokker Friendship in Mackay, Queensland, in June 1960. The judge inquiring into the mysterious crash was told of the development of the ARL crash recorder and, as a result, made a judicial order that all Australian airliners should carry recorders for pilot speech as from January 1963. 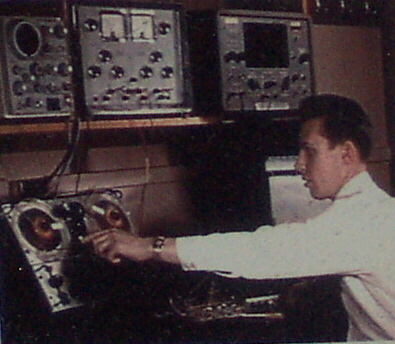 In view of renewed interest in crash recording Dr Warren who worked in the Mechanical Engineering Division of ARL sought the help of electrical/electronic specialists from the Aerodynamics Division to design and build an updated pre-production version of the recording and recovery system with improved performance (let us call the updated version Mk 2). My black box involvement began around March 1961 when the development of the improved system of airborne recording and ground station recovery equipment was undertaken prior to in-flight testing. This was around the time of my first meeting with David Warren and found him then to be an inspirational scientist well capable of "thinking outside the box". Our friendship endured through the years. 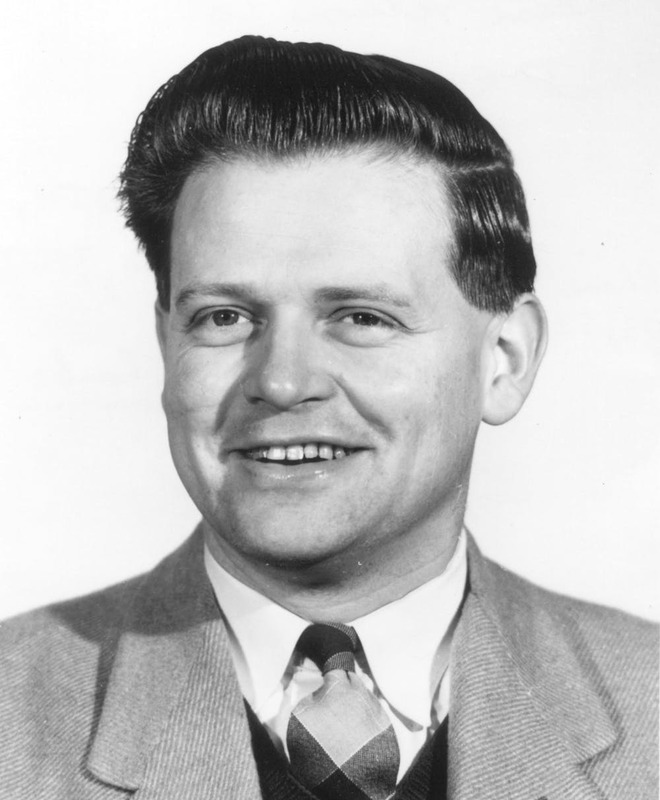 Although Dr Warren was a combustion/fuels specialist, he had a keen interest in electrical science and was capable of defining the requirements in that area. However, he required electrical design specialists for the development of the updated system. Flight data recorder (FDR) providing the recording of 8 data channels at a rate of 24 channels per second. Retention of last four hours of information with automatic overwrite of earlier information. Capability to continue recording after loss of aircraft electrical power. Capability of the recording medium to survive intense fire for an extensive period (confirmed), impact survivability untested. The Mk 2 pre-production prototype was installed in the Department of Civil Aviation Fokker Friendship aircraft, VH-CAV, and the test flight took place on 23 March 1962 departing from Essendon airport (in Melbourne, Australia). Recording and recovery of cockpit voice and flight data were 100% successful. It was my first flight test and I was aged 24 at the time. While no tests were performed on a deployable unit the idea was in the forefront of those being investigated by Dr Warren. A detachable recording medium within a foam plastic aerofoil and fitted with a radio beacon transmitter was one such possibility under review. It was based on a type that had been developed by the National Research Council of Canada. More details are provided in the 1962 Ref. 4 film. No work was included on underwater or over-land crash locator beacons that are standard for current day passenger aircraft. The over-land locator beacons are not part of the black box units. At the time of the 1962bflight ARL was part of the Department of Supply, not the Department of Defence as became the case later. And so it was that we captured that small window where we could be involved with civil aircraft. Without that window I believe we would not have had the opportunity to pursue such a venture. A major limitation of the use of magnetic wire was that, unlike magnetic tape, it was essentially a single recording track medium. That meant that the audio and flight data channels needed to be restricted to separate frequency bands. The flight data were time multiplexed and used a pseudo-digital recording technique. 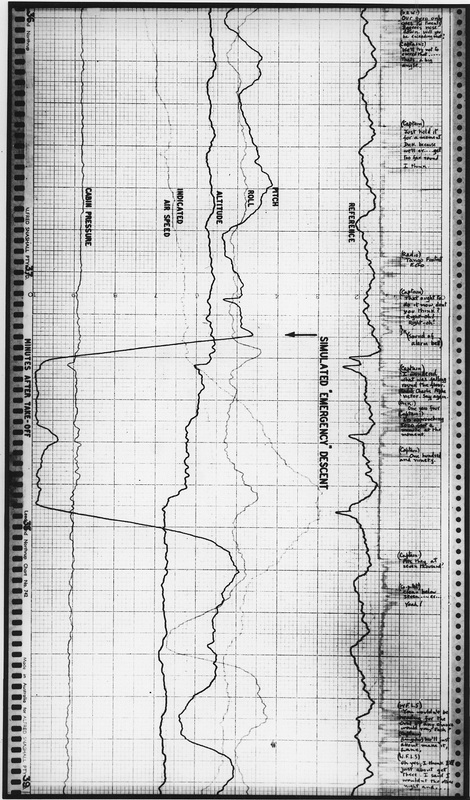 Graphical plots of the recovered data from the 1962 concept validation flight are included in the column of images on the right. 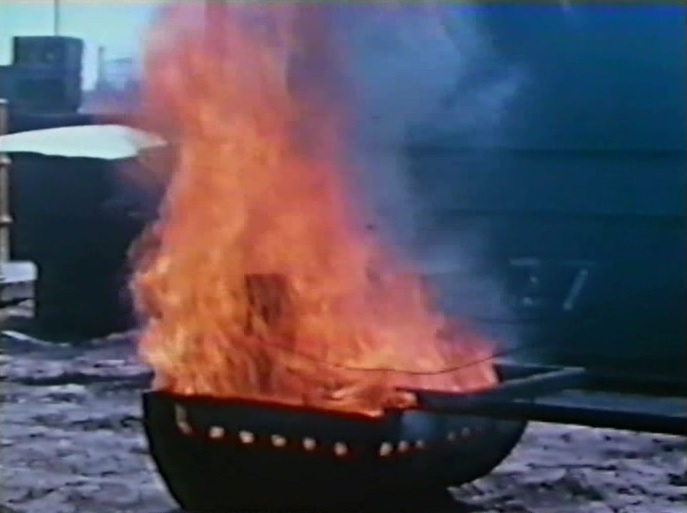 Best flight parameter accuracy was achieved when the Ground Station was connected to an external electronic counter (and an associated digital printer if a permanent record were required).A photograph of the intense fire test performed at ARL, also in 1962, of the recording within the fireproof enclosure is also included in the column of images on the right. In anticipation of the coming British Ministry of Aviation (MOA) accident recording mandatory requirement, the British firm of S. Davall & Son approached ARL for the production rights. Subsequently the MOA announced a requirement for airliners to fit an FDR but a CDR was omitted in this initial requirement. 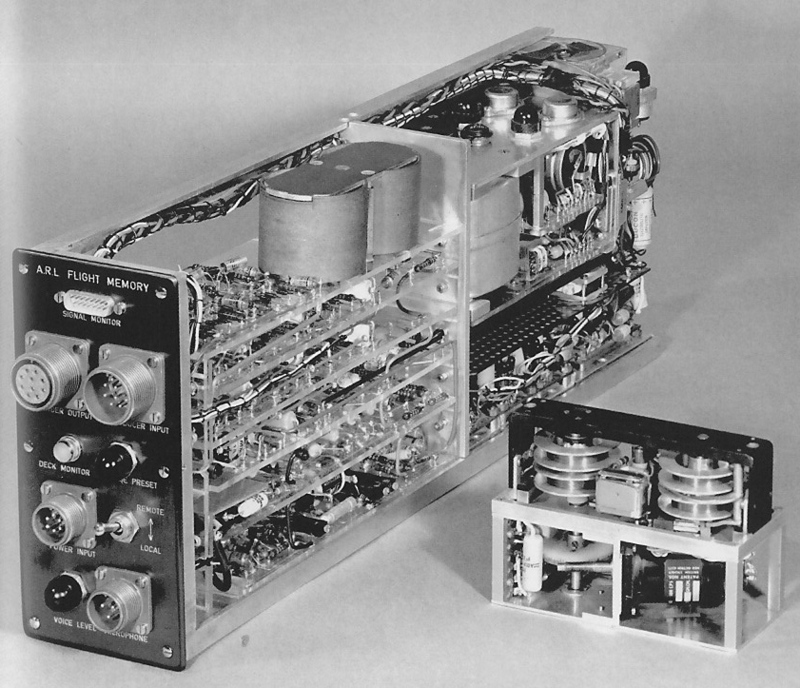 British European Airways (BEA) contracted Davall to make the recorder but the electronics contract went to Plessey. 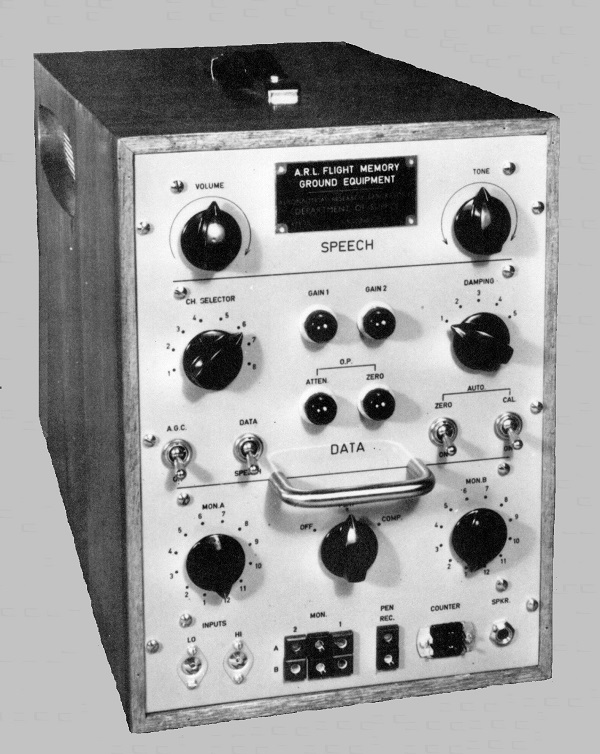 The Davall "Red Egg" accident recorder using magnetic wire as the recording medium was developed based on the ARL system and won a large part of the British and overseas market at that time. Cockpit voice recording did not become mandatory in England until after the "Staines disaster" on 18 June 1972 when BEA Flight 548, on a scheduled passenger flight from London Heathrow to Brussels, crashed soon after take-off, killing all 118 people on board. The ARL system was never patented and never went into production either in Australia or overseas. When built it was ahead of its time. Prior to the 60th anniversary of the ARL/DSTO Melbourne laboratory in 1999 Dr Warren and I wrote a summary of the ARL Black Box history with the pre-1961 aspects being totally attributable to Dr Warren. This document (Ref. 5) reveals the difficulties presented with convincing people that the black box idea was worth pursuing. Doubters were plentiful. This document provides an authentic summary information on the ARL Black Box. 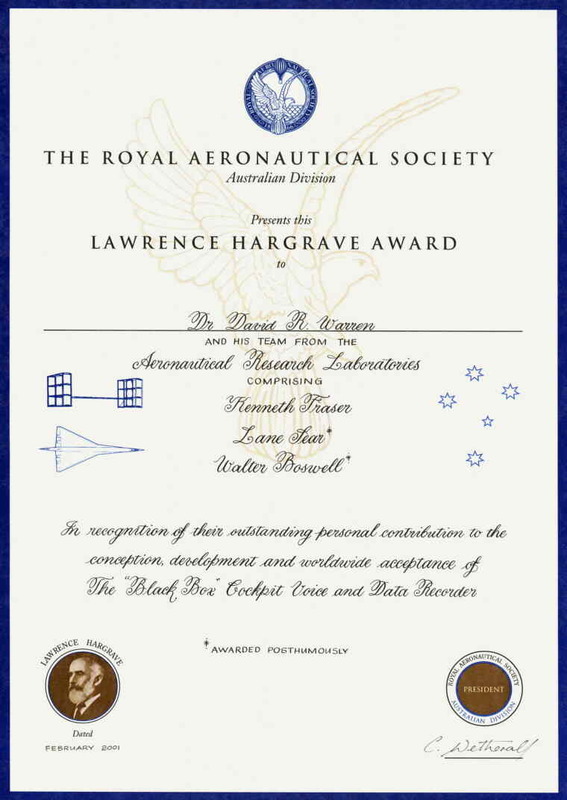 Dr Warren, together with the team involved in the pre-production prototype development, were recognized in the Lawrence Hargrave Award granted by the Australian Division of The Royal Aeronautical Society in February 2001 (almost 40 years after the successful flight demonstration occurred). The award was presented by The Hon John Anderson MP, who was the Australian Minister for Transport at the time. A photograph of the award is included in the column of images on the right. In November 2000 he was awarded the Millenial Hartnett Medal from the Royal Society (Victoria Chapter) for the Encouragement of Arts, Manufacture and Commerce. In January 2002 he was appointed an Officer in the General Division of the Order of Australia for his "service to the aviation industry, particularly through the early conceptual work and prototype development of the black box flight data recorder". In 2007 he was included on the "Top 100 living geniuses" list compiled by a panel of six experts in creativity and innovation from Creators Synectics. In Nov 2008 Qantas named one of their Airbus A380s "David Warren" in honour of his services to aviation. In 2012 the Australian Broadcasting Commission (ABC) celebrated its 80th anniversary by highlighting 80 special events over that period and his published "black box" work in 1954 was one of those. 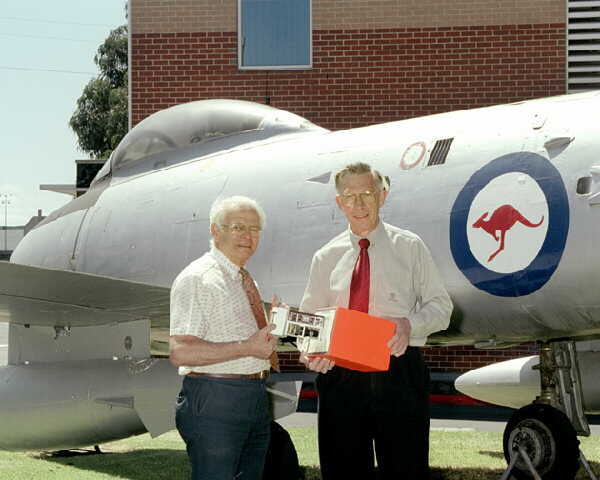 In November 2013 he was inducted into the Australian Aviation Hall of Fame. 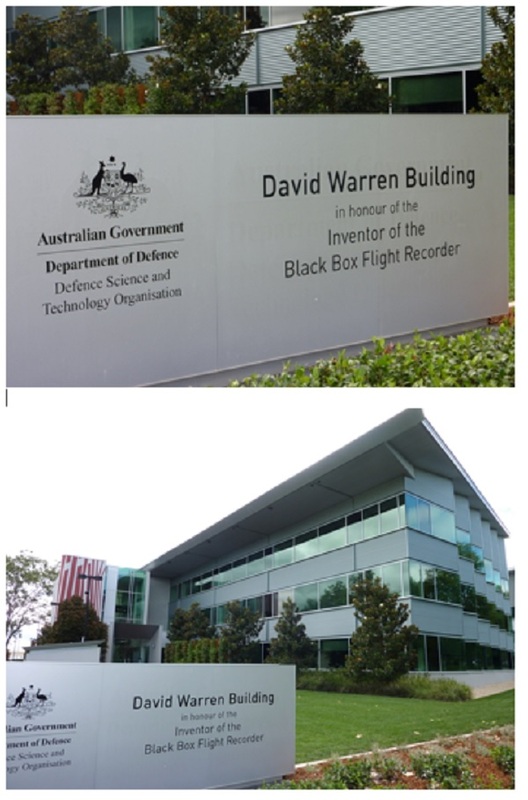 In March 2014 the DSTO Headquarters building in Canberra, Australian Capital Territory, was named after him in recognition of his pioneering contribution to air safety (photograph included in the column of images on the right). In September 2016 he received (posthumously) the International Civil Aviation Organization (ICAO) Forty-first Edward Warner Award in Montreal Canada. My involvement in the Black Box development has been reported in publications 9, 10, 25 and 41 on my List of Publications page. I still find it hard to comprehend that the work I did at about age 24 (my age at the time of the successful flight demonstration on the Fokker Friendship aircraft) is the item for which I have received most compliments. Most of the Black Box hardware is held at the Scienceworks Museum, 2 Booker Street, Spotswood, Melbourne, Victoria 3015, Australia. The Mk 2 wire recorder and its crashproof housing is held at DSTO's Melbourne Laboratory, 506 Lorimer Street, Fishermans Bend, Victoria 3207, Australia. Other sources of information on the ARL Black Box are included in the list below. Author Jeremy Sear (Black Box Ref. 11) is a grandson of Lane Sear, a member of the team honored via the Lawrence Hargrave Award in 2001. Ref. 11 is a pdf formatted version of Jeremy Sear's original html document with updated links that I produced on 20-Jan-2013. Of special note is the book written by Janice Witham (Black Box Ref. 12) - she found "intrigue, drama, controversy, a dash of mystery and a lot of unanswered questions" in writing the book. Her book is the most comprehensive publication on the ARL Black Box development with particular reference to the personal background relating to Dr Warren and to the impediments he faced in gaining acceptance for his ideas. Films produced in 1962 and 1990 are referred to in Refs 4 and 9 respectively. They can be run on-line or downloaded. Ironically, the ARL Black Box topic has come alive in recent years after being dormant for about 40 years. In 2012 schoolgirl Eve Cogan from Sydney Australia organised a petition that promoted having the Canberra airport named after Dr Warren. At the time of this update (January 2016) such naming has not transpired. On 23 March 2015 the BBC presented a Warren Black Box item on its Witness radio program. It included interviews with two of the children (Jenny and Peter) of David and Ruth Warren, and with Dr William Schofield whose first employment at ARL was under the direction of Dr Warren and who later became a Director of the laboratory. I was not available for the interview as I was overseas at the time. Go to Ref. 15 if you wish to listen to the podcast. Accident recorders have progressed a long way since the Dr Warren invention days. Australia became the first country to make the fitting of both CVR and FDR mandatory on large passenger aircraft. In other countries the requirement to fit CDRs occurred later than that for FDRs. 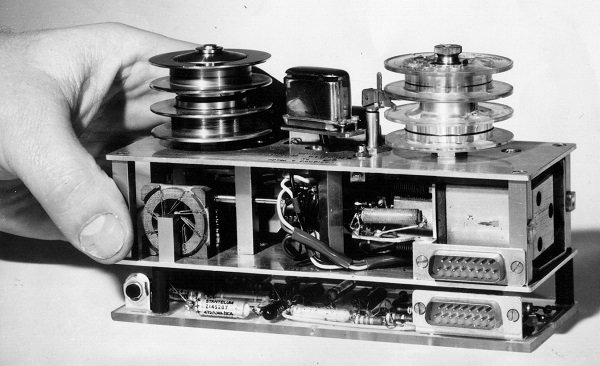 Multi-track magnetic tape recorders soon overtook magnetic wire recorders. CVRs and FDRs fitted before the 1990s were always housed in separate boxes. With the advent of high storage capacity solid state memory recorders in the 1990s, the combination of the CVR and the FDR in the one box became feasible and the fitting of the combination, referred to as a CVFDR, was adopted for some aircraft. 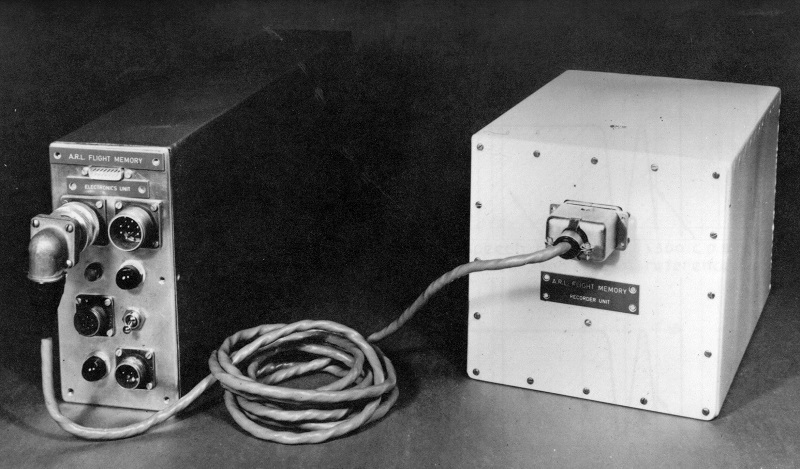 Although fairly rudimentary, the ARL Black Box was a CVFDR. Because at various times I receive requests for better resolution images, I have put together the best ones I have available. While all the images on this page are included, there are some additional ones. Regrettably, I do not have improved quality images for some taken a long time ago. Click here to go to the page that describes the images and provides links to them. Warren, D.R., "A device for assisting investigation into aircraft accidents", ARL-MECH-ENG-TECH-MEMO-142, April 1954. Warren, D.R., "Tests in the development of a crash recorder", ARL-MECH-ENG-TECH-MEMO-180, April 1958. Warren, D.R., "A.R.L. 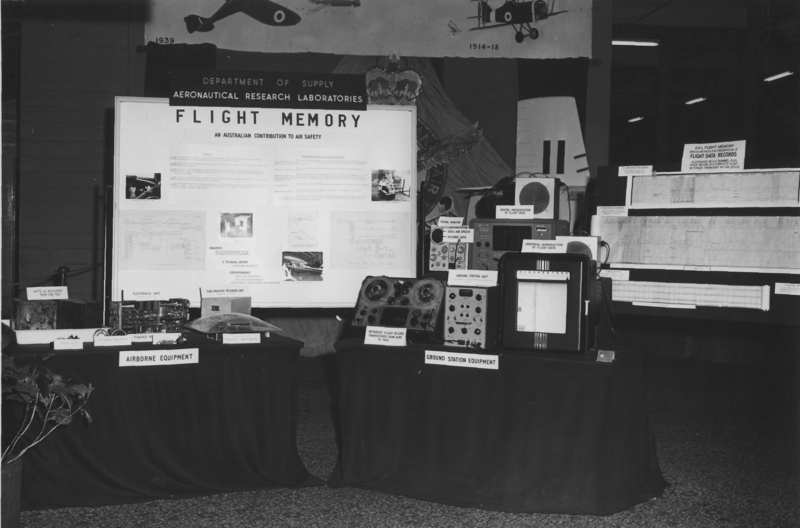 Flight Memory Project Part V: A proposed programme for airborne trials", ARL-MECH-ENG-TECH-MEMO-219, March 1961. Australian Government Department of Supply ARL Black Box 8 min 39 sec film produced in 1962 after the successful 23 March 1962 black box concept demonstration flight. Dr Warren provided the voiceover. Click here to run or download film (132 Mb). Warren, D.R. and Fraser, K.F., "The Black Box: An Australian Contribution to Air Safety", 16 July 1998. "Black Box Flight Recorder", DSTO public website.
" 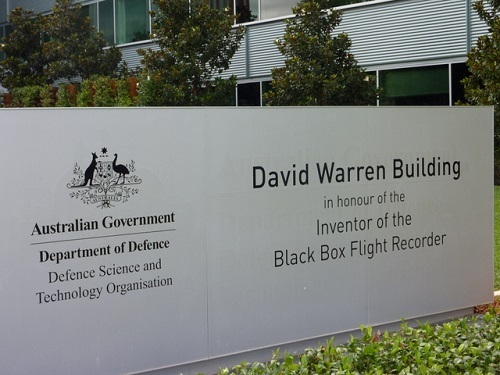 Dave Warren - Inventor of the black box flight recorder", DSTO public website. "Dave Warren - Biography", DSTO public website. Pay TV Discovery Channel: Invention Episode 5 (second item) "Black Box", Smithsonian Institution presentation, copyright 1990. The duration of the ARL Black Box segment is 5 min 10 sec. Film production for the ARL segment was performed by the Beyond International Group in 1990. Click here to run or download the ARL segment (79 Mb). 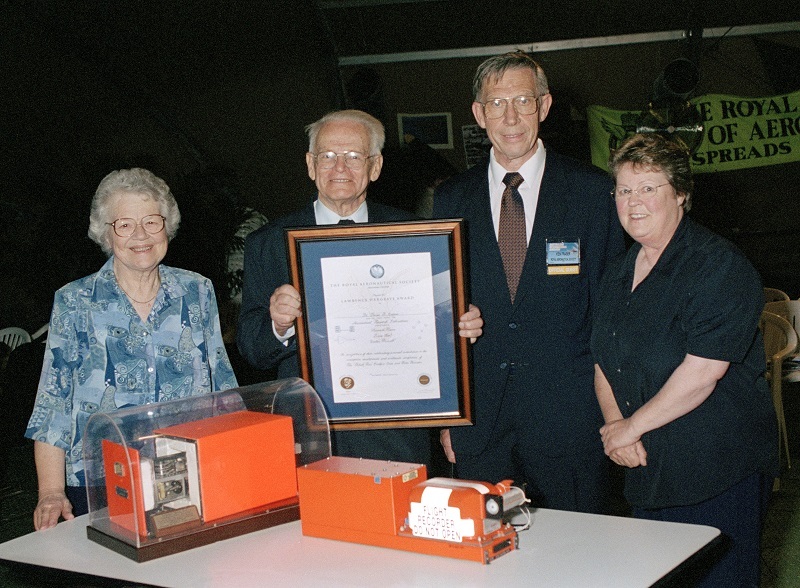 Jeremy Sear, "The ARL 'Black Box' Flight Recorder - Invention and Memory", Thesis Ref. 14567 for Bachelor of Arts (Honours), Department of History, Faculty of Arts, The University of Melbourne, October 2001. "Documents (mainly correspondence) referring to the development of the Black Box voice-plus-data recorder", National Library of Australia archives, catalogued in the on-line database Kinetica. The document comprises a batch of about 860 pages of A4 size and was passed to the National Library on 16 Dec 1999. "Black Box", Janice Witham, February 2005, published by Thomas C. Lothian Pty Ltd, 11 Munro Street, Port Melbourne, Victoria, 3207. 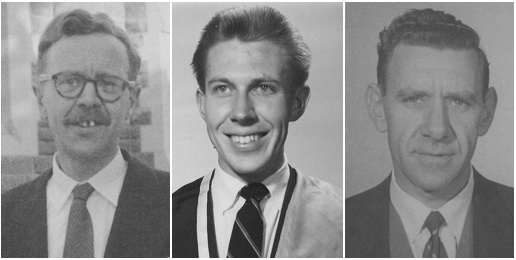 "Vale David Warren AO: 1925 - 2010", DSTO public website. Bill Schofield, "Bill Schofield’s Hargrave Memorial Lecture", 6 December 2010. Australian Government Civil Aviation Authority, "The dawn of the black box", Flight Safety Australia magazine, January - February 2013 edition. BBC Witness radio program “Invention of the Black Box”, 23 March 2015, 8 minutes. Access this podcast here on this website or on the BBC World Service. Because of local and international interest by film makers, I receive requests for higher quality images relating to the Australian black box and the participants in its development. In most cases there is a scarcity of good quality images taken during the early development time. Click here to view the best quality images I have, including others that do not appear on this page.